Introduction to Nucleonica: Core Applications and Tools, 10-11 April, FTU-KIT, Karlsruhe, 2014. The focus of this 2-day introductory course will be nuclear data and related nuclear science applications. The course is aimed at persons who provide technical support (measurements, interpreting results, drawing conclusions, making recommendations) for the actions taken in response to environmental radioactivity issues, nuclear security, decommissioning, etc. The course is suitable, for example, for physicists, radio-chemists, health physicists, technical experts etc. working within the nuclear industry, nuclear research organizations, universities, regulatory authorities and nuclear medicine institutes. Completion of this course will enhance and support nuclear related decision-making as well as provide formal academic knowledge in the field of nuclear science. A basic knowledge of physics and chemistryis required for participation in this course. The sessions will be held in English. Please find attached the third Nucleonica Newsletter in which we would like to inform you on the progress made in 2013 and our plans for 2014. In line with our mission to make nuclear education, training and nuclear competence building more effective and interesting for our users, we continue to strive to provide the best and most reliable online tools in nuclear science. During 2013, we have continuously upgraded the Nucleonica applications with a view to improving user-friendliness and calculation / response times. – New Karlsruhe Nuclide Chart Online (KNCO): It is with great pleasure that we announce the release of a new product – the Karlsruhe Nuclide Chart Online (KNCO). For over 55 years, the Chart has been available only in print versions. This new release of the online version is a landmark in the evolution of the Chart. The major advantage of this new online version is that, through regular maintenance, it will always be up to date to provide you with the latest nuclear data. In this section we describe the main features of this new development. – What’s New in Nucleonica: Over the past 12 months, the applications Nuclide Datasheets++, Decay Engine++, Dosimetry & Shielding++, e-Ship++ have all undergone major revision. The use of the “++” following the application name denotes the new version. In this section, we describe in more detail the new features of these and other applications. – Training Courses: Training courses on the use of the Nucleonica applications have kept us very busy over the past year. Here we provide a short summary of the various courses held in the past year. 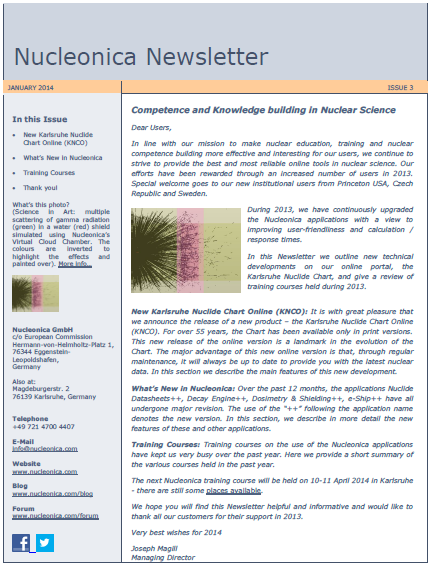 The next Nucleonica training course will be held on 10-11 April 2014 in Karlsruhe – there are still some places available. We hope you will find this Newsletter helpful and informative and would like to thank all our customers for their support in 2013. 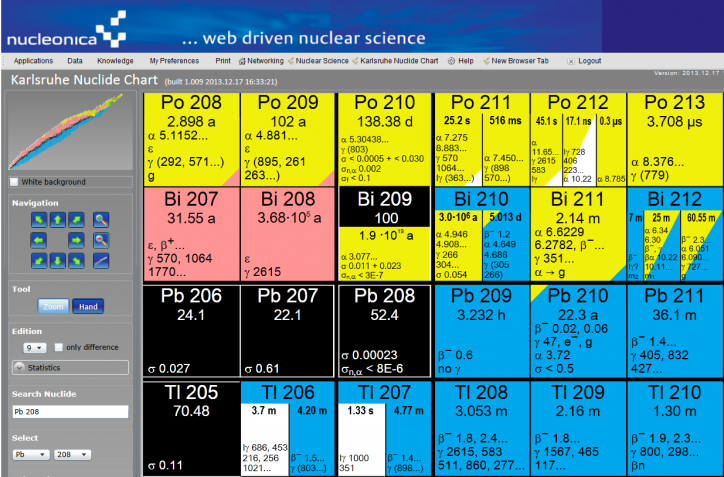 For more than 50 years, the Karlsruhe Nuclide Chart has provided scientists and students with structured, accurate information on the half-lives and decay modes of radionuclides, as well as the energies of emitted radiation. Beyond the more traditional physical sciences such as health physics and radiation protection, nuclear and radiochemistry, and astrophysics, the Chart is now in wide and common usage in the life and earth sciences (biology, medicine, agriculture, geology, etc.). An important characteristic of the Chart is its great didactic value in education and training in the nuclear sciences. This new online version is a major landmark in the evolution of the Karlsruhe Nuclide Chart and is a valuable and welcome addition to the print versions.